This charming stone villa with private pool is located on the hillside above the seaside village of Stoupa, one of the pearls of the Peloponnese, there are beautiful views of the mountains and the sea. The walk into the village and beach takes around twenty-five minutes. Villa accommodation for 6 people and one small child, 3 bedrooms, 2 bathrooms, satellite television, wifi internet. The ground floor has a living and dining room with fireplace and an open-plan, fully equipped kitchen (no dishwasher) with access to the pool area. Twin bedroom (2 x 90 cm wide beds) which opens onto the patio terrace and has sea views. Double bedroom with access to the pool area. Bathroom with small bath and shower attachment and toilet. The upper floor has a double bedroom which opens onto a large balcony terrace with magnificent views of the sea and the mountains, it has a covered section with chairs and table. Bathroom with small bath and shower attachment and toilet. The enclosed garden area is mainly patio and by the pool is a covered area where you can eat outside in the shade. There is plenty of garden furniture for relaxing. 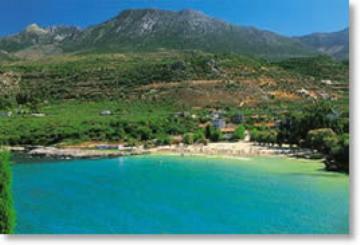 Kalamata airport is 50 km (the taxi fare is reasonable and it is easy to hire a car in the resort for a day or so, therefore the option for a car free or partly car-free holiday is possible). Athens airport is around three and a half hours drive (motorway as far as Kalamata). Optional; continental breakfast basket at 5,5 euros per person. Bed linen and towels (linen changed every three days). Daily cleaning. Security deposit payable locally 500 € or equivalent.